Since opening its doors in 1988, the comprehensive health clinic for patients with HIV/AIDS has had a lot of successes and milestones worth commemorating. The first cases of Acquired Immunodeficiency Syndrome (AIDS) in the United States appeared in the early 1980s. A short time later, the 1917 Clinic at the University of Alabama at Birmingham (UAB) opened to take on the disease. Now, 25 years later, the clinic is going strong and celebrating all of the birthdays achieved through its research, education and care. Saag went on to propose starting a comprehensive health clinic for patients with Human Immunodeficiency Virus (HIV) and AIDS. On January 28, 1988, the 1917 Clinic opened its doors at its now former location, 1917 5th Avenue South, with Saag serving as founding director. The AZT study was just the beginning. Of the 27 antiretroviral drugs now approved for AIDS, seven were tested first in patients at the 1917 Clinic in Phase 1 clinical trials. Current 1917 Clinic Director James Raper, D.S.N., CRNP, who first joined the staff in the mid ’90s, explained that, looking back over the history of the clinic, there is a lot to be proud of and commemorate. 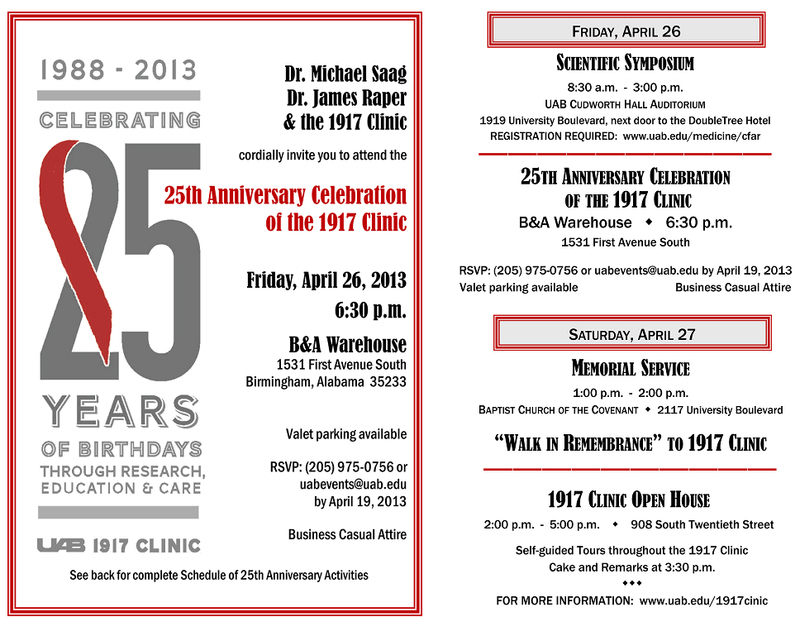 In observance of 25 years of birthdays through research, education and care, a weekend of events will be held starting with a scientific symposium on Friday, April 26, from 9 a.m. to 3:00 p.m. at the UAB Cudworth Hall Auditorium. “We wanted to invite prominent leaders of the HIV scientific community who had roots and connections to UAB to be here and inform us about the current status of science in the field of HIV from their individual perspectives,” Raper said. Presenters will include George Shaw, M.D., Michael Kilby, M.D., Eric Hunter, Ph.D., Michael Mugavero, M.D., Victoria Johnson, M.D., Paul Goepfert, M.D., Mary Fisher, a patient of Saag and Raper’s. Saag will moderate the event. “It will be an intellectually stimulating day that will be filled with memories, catching up and getting reacquainted with each other, as many of these researchers came from UAB,” Raper added. A celebration party will be held Friday night will at the B&A Warehouse at 1531 First Avenue South, at 6:30 p.m. The 65th birthday of Mary Fisher will also be celebrated at the event. On Saturday, April 27, a memorial service will be held from 1-2 p.m. at the Baptist Church of the Covenant, 2117 University Boulevard, followed immediately by a "Walk in Remembrance" to the 1917 Clinic. To cap off Saturday’s events, an open house will be held at the 1917 Clinic from 2-5 p.m., with cake and remarks at 3:30 p.m.
“This is our opportunity to showcase where we deliver care and the resources that we have here; this is going to give folks in the community the chance to meet the people who work tirelessly to provide the best care possible to every patient that comes through our doors,” Raper concluded.